Avant compact loaders can master all jobs a quad bike can perform. Powerful pulling force and four wheel drive means that you can tow big loads with ease. The lift arm it also has excellent loading capabilities – whether earth moving, material removal or similar jobs. Powerful auxiliary hydraulics enable an extensive range of attachments, making Avant Loaders a leader in efficiency and versatility. 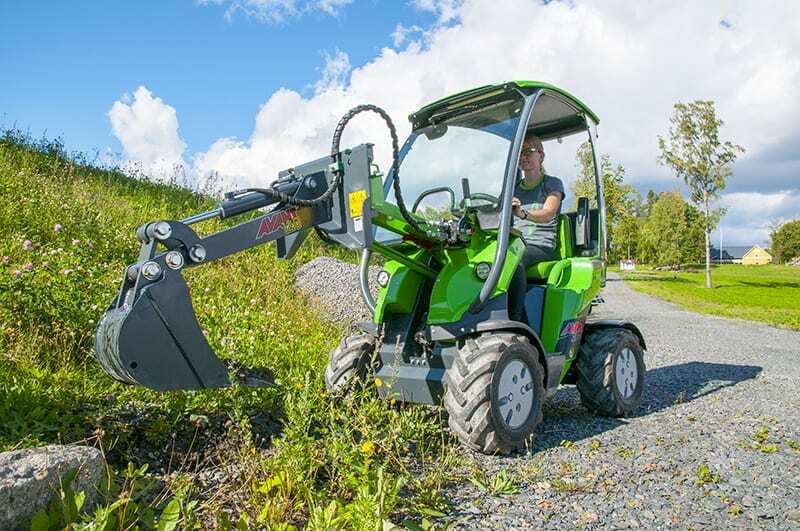 Avant compact loaders are an all round multi-task machine for gardens, parks, property maintenance, estates and other green areas. The Avant Loaders will help you to enjoy building and maintenance tasks. It is the perfect machine for preparation and maintenance of gardens, lawns and vegetable gardens. Avant Loaders also don’t rip up or damage the surface, making it the perfect choice over any machine with tracks! The articulated Avant Mini loaders with pivot steering are much more nimble and versatile than a compact tractor. With Avant Articulated Loaders, you can easily manage all property maintenance tasks all year round – even in tight situations. Four wheel drive, strong lift arm and powerful hydraulics allows an extensive range of attachments to be used. This makes Avant articulated loaders the best machine for property and estate maintenance. Avant Mini Loaders have a range of additional options available including headlights, beacon, blinkers and reflectors. Avant articulated loaders are the perfect all-year-round multi task machine for property & estate maintenance. On larger estates it is a great time and money saver due to the versatility and speed of the machine. Many councils and local authorities already utilise a 200 Series machine in their parks and yards. This is due to Avant Loader’s not damaging the ground and easily transforming using a different attachment. A ride on mower and wheel barrows are great tools, but landscaping and ground care require more versatility. Landscapers and Gardeners need a multi function machine that can perform all tasks. Whether laying and maintaining or mowing lawns and garden beds, sweeping, planting trees and bushes or even digging fountains, the Avant can exceed expectations. Forecourt maintenance and preparation works for paving are also easy and fast with the 200 Series. With the same machine you can also transport and level sand and topsoil efficiently – accessing places where other machines cannot go. Additionally, the lightweight and compact Avant loader is also easy to transport from one site to another whether by trailer, or on the back of a truck. T0 see the range of attachments available please click here. Avant compact loaders are designed and manufactured by Avant Tecno in Finland. For more information call 1800 686 411 or contact us.